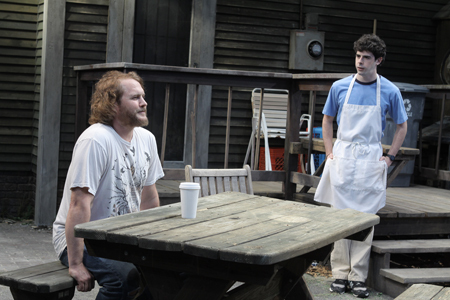 Psilocybin Tea and Sympathy: Studio Theatre's The Aliens, reviewed. Scot McKenzie and Brian Miskell in The Aliens. Photo: Scott Suchman. Wherein I gradually fall under the under the slow-burning spell of Annie Baker's The Aliens, the pausiest third of her Vermont Trilogy. I reviewed its other two-thirds already: Theater J's production of Baker's Body Awareness back in September, and Studio's production of her Circle Mirror Transformation two years ago. This Band Is Your Band: Woody Sez, reviewed.